If you haven’t read my other acorn posts, Acorns and the Forager’s Dilemma is an introduction to the use of acorns; the Forager’s Dilemma is, in a word, starch. Starch (carbohydrates) is the toughest thing to forage for, and is a primary reason why humans settled down 10,000 years ago to grow grain. Next I wrote about an interesting Acorn Honey Cake I’d made and how various world cultures have traditionally used acorns, cultures ranging from Korea to Japan to the Native Americans, Europeans and North Africans. 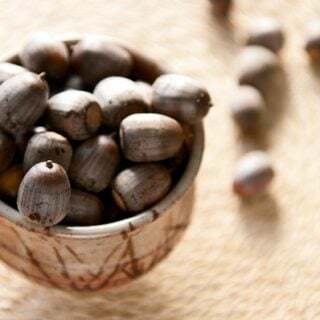 Using acorns as food pretty much falls into three categories: Eating acorns as nuts (they are a lot like chestnuts), making acorn flour, or cooking in acorn oil. I have not yet tried to make acorn oil, but I know how to do it and plan on trying it when I am a bit more mobile. First you need to get yourself a supply of acorns. Go find some oak trees; they’re the ones with all the acorns that have fallen down around them. I know this sounds condescending and stupid, but oaks come in so many varieties that in autumn this really is the easiest way. It is a bit of a crapshoot, as it is tougher to determine a variety of oak by its acorn than by its the leaf — you can do it, but it is a little harder. says she likes to collect Tanoak acorns in February and March, after many have begun sprouting. A word on worms. When I first gathered acorns, little did I know that I had gathered scores already infected with the larva of the oak weevil. Nasty little maggoty things, you can tell they are inside your acorn if there is a little hole in the shell. Look for it, discard that acorn and move on. But know that oak weevil larvae bored those holes from the inside out. Like Alien. It’s helpful to know what kind of oak you are dealing with because acorns from different oaks have different levels of tannins in them; more on that in a bit. If you don’t know your trees, start looking for little green acorns in May. Pick a leaf and compare it to oak leaves online or in a guidebook. Gather acorns and compare them to online images and guidebooks; different oaks bear acorns with different shapes. With that in mind, remember that not all oaks are created equal, and the fundamental fact of cooking with acorns is that you are dealing with a wild food, and as such must contend with tremendous variability, both in species and even among individuals of the same species. Some oaks bear acorns so low in bitter tannins that they can be eaten raw. Legend says that California Indians fought over these trees, which makes some sense because one mature Valley Oak can drop 2,000 pounds of acorns in a really good year. A ton of sweet acorns may well be worth fighting over. Tannins aren’t the only thing that makes different species of acorn different. UC Riverside Professor David Bainbridge wrote in a 1986 academic paper that depending on species, acorns can range in fat content from 1.1 percent to 31.3 percent, protein from 2.3 percent to 8.6 percent, and carbohydrates from 32.7 percent to 89.7 percent. That is a huge range! ‘Sweetest’ Acorns, meaning lowest in tannin: East Coast White oak, the Emory oak of the Southwest, the Pin oak of the South, the Valley and Blue oaks of California, the Burr oak of the Midwest, as well as the Cork oak and the well-named Bellota oak of Europe. To my California readers, know that there are an awful lot of cork oaks and burr oaks planted in towns and cities here, so keep your eyes peeled. Largest Acorns: Valley oaks are really big, as are East Coast White oaks. Burr oaks are large, too, as is the California Black oak. Fattiest Acorns: The Eastern red oak acorns I’ve used have a very high oil content, and I’ve read that the Algonquin Indians used red oak acorns for oil. In the West, the champions are both live oaks, the Coastal and the interior live oak, as well as the tanoak and black oak, which is Quercus kellogii. I found that shelling the acorns is the most onerous part of dealing with them. They have an elastic shell that resists normal nut crackers. I found whacking them with a hammer to be the best way to open up an acorn. Some people use a knife, and I do this with green acorns, but not fully ripe ones. Best way to whack ’em is to put the flat end (the side that used to have the cap) on a firm surface and rap the pointy end with a hammer, or, with long, tapered acorns like cork oak or Valley oaks, just whack the side. Acorns are far easier to shell after they’ve dried. If you choose to dry them, do this in wide, shallow pans so they don’t get moldy. Once dried, I’ve worked with two-year-old acorns and they were fine. 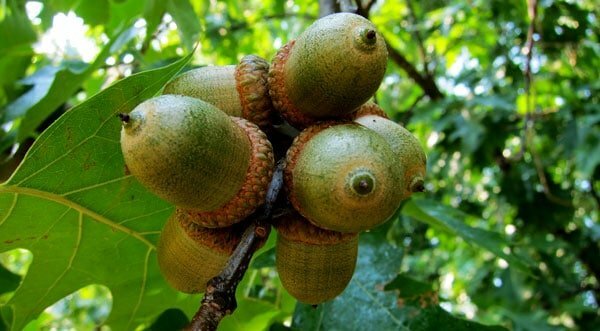 Red oak acorns have a “test,” a skin that doesn’t want to come off, just like a chestnut. If you boil the acorns and shell them while still hot, the skin comes right off. Only do 5 to 10 acorns at a time if you are doing this, or they’ll cool too much. I only bother with this when I am making acorn bits, not flour. The skin is a little bitter, but it’s not that big a deal if you are making flour. Shell your acorns into water. The meats oxidize fast, and you will get a lighter-colored flour if you do this. It’s aesthetic, but it matters to me. All acorns should be leached with water to remove bitter tannins, which will a) make your mouth feel and taste like felt, b) make you a bit nauseous, and possibly c) constipate you for days. Getting those tannins out is the big barrier to cooking with acorns. But it ain’t no biggie. With my Valley oak acorns, after shelling I drop the acorn meats directly into my stockpot that was two-thirds full of water. When I fill the pot about a third of the way up with shelled acorns, if I am in a hurry, I bring the pot of water to a boil. The water turns dark. As soon as it boils, pour the water off into the sink and repeat the process. 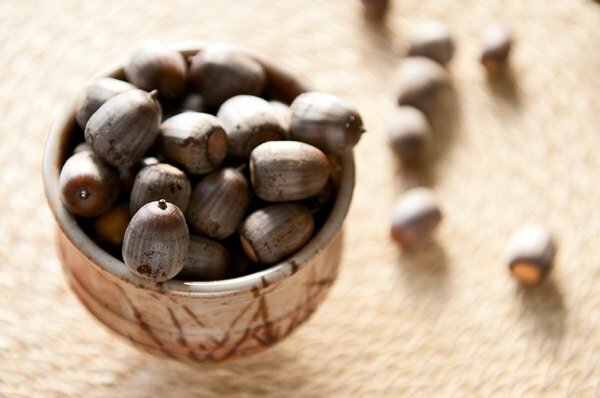 It requires about five changes of water to get Valley oak acorns to taste like chestnuts. I did this all while watching football, and did not miss a snap. Other oaks will require more or fewer changes of water. Choose the “sweetest” acorns on my list above for the least amount of work. There is a better method, but it takes days. Grind the raw acorns into flour, then mix 1 cup of acorn meal to 3 cups water. Pour this all into a glass jar with a lid and put it in the fridge. Every day you shake the jar, wait 12 hours or more, then pour off the water — and the tannins. How long? Anywhere from a week to two weeks, depending on how bitter your acorns are. This is a good way to leach acorns without using fuel for boiling water, and you do not denature a particular starch in the acorns that acts a little like the gluten in flour, i.e., it helps the flour stick to itself. I go into the full process of cold leaching acorns here. If you plan on baking with the acorn flour, use the cold-water leaching method. Once your acorns are free of tannins, you need to figure out what to do with them. Regardless, you need to dry them first or they will rot. Big pieces can be patted dry on a tea towel. If it is hot out, lay the acorns out on cookie sheets and dry in the sun. You could also put them in an oven set on “warm.” You can also put the acorns in a dehydrator set on low heat. You can also freeze your fresh acorn meal. 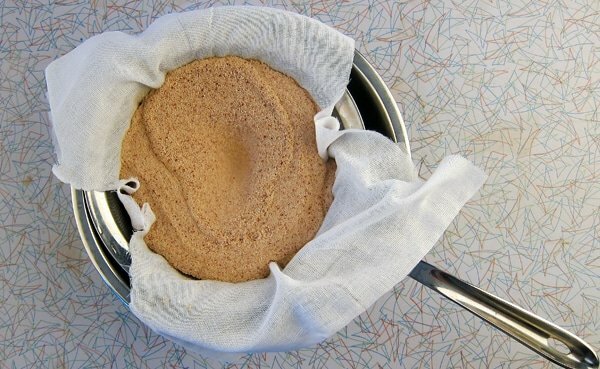 Store dried flour in jars in the fridge. Why the fridge? What fat there is in acorns will go rancid pretty quick if you left the flour at room temperature. What you can now do with this flour is pretty limitless. My first success was an acorn flour flatbread in the style of an Italian piadina, which is essentially a tortilla. I then made acorn flour honey cake, which is really very tasty — almost like gingerbread cake. The flour also makes an excellent pasta dough when mixed with regular flour. Find more recipes using acorns and other wild nuts and starches here! I have several white oaks or maybe a burr oak. Anyhow I picked up tons of the squirrels nuts they I believe where trying to bomb me anytime I came into my back yard… No really a bunch of acorns and was curious if there’s a market for them? Thanks for your help look forward to hearing back. Ron: I don’t think there is a market for acorns, unless you know a hog farmer. Pigs love them and hog farmers will often pay you a little money for them. Better left for wildlife like deer,turkeys, blue Jays etc.,although I have stopped ,picked up, & eaten acorns that had fallen off the Chinquapin Oak tree,while walking back to my truck after a long day in my tree stand deer hunting.They are small , & you have to crack the shell,but their not bad raw.I see why the deer always go after them as soon as they are ready!!! I believe & I am almost certain the Chinquapin Oak is a member of the “White Oak” family group.Most of the acorns off “White Oak” varieties have less tannin in them,which make them much more palatable than those acorns off of the “Red Oak” varieties.It’s my opinion that most are left for the wildlife to help sustain them through the winter months. I have a chestnut oak nearby and think the flour from those acorns is very tasty.